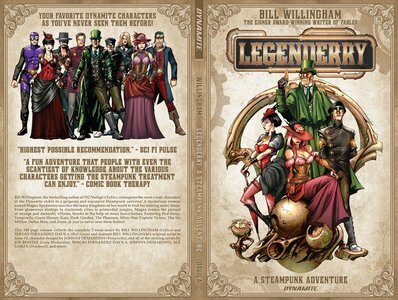 Bill Willingham, the bestselling author of DC/Vertigo's Fables, reimagines the most iconic characters of the Dynamite stable in a gorgeous and expansive Steampunk universe! A mysterious woman named Magna Spadarossa searches the many kingdoms of her world to find her missing sister, Sonja. From glamorous airships to clockwork cities to primordial jungles, Magna evades the pursuit of strange and dastardly villains, thanks to the help of many brave heroes. Featuring Red Sonja, Vampirella, Green Hornet, Kato, Flash Gordon, The Phantom, Silver Star, Captain Victory, The Six Million Dollar Man, and Zorro, as you've never seen them before!